Their hats are woven very skillfully and stoutly from fir [spruce]-roots, with wide brims and a low crown slightly pointed at the top, and they are decorated with various designs. 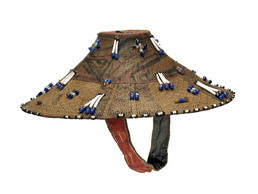 Sugpiaq men wore woven spruce-root hats decorated with glass trade beads and dentalium shells. Weaving on the brim was patterned to make radiating diagonals, zigzags, or diamonds, while the crown was smoothly woven for painting. The image on this hat represents an animal – possibly a hunter’s helping spirit – with its face forward and teeth displayed; its body wraps around the crown. The eyes look like goggles, a style also seen in Yup’ik and Deg Hit’an spirit art. Men wore spruce-root hats both at sea and during winter hunting ceremonies. Martha Matfay: Just like those regular straw hat – a top and made a wide brim on it. Laurie Mulcahy: Oh, like a sombrero type? Martha Matfay: It was just flat. . . .
Nida Chya: Just straight that rim. Laurie Mulcahy: And it would be round? Nida Chya: Yes, real round. Just like a straw hat. . . . They put design on them, all kinds of designs. Nida Chya: Oh yes, all around, and it was pretty. Laurie Mulcahy: Did it look like this? I’ve got a sketch of an old hat that was from Karluk. It’s made of woven spruce roots. And these are sea lion whiskers. And then all of these are beads and dentalium shells. Martha Matfay: Yes. They must have had lots of beads before, because in Karluk we used to dig around on the bank and find all kinds of beads. Some of them were pretty good size beads. . . . They really used to decorate their things when they make them.